Where to buy Indian fish in Dallas? 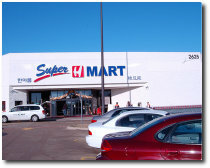 Dallas has a diverse international population with a lot of expats with Asian and Indian backgrounds and we were fortunate enough to find a grocery store chain called H-Mart. H-Mart is a Korean store and has a wonderful seafood section where you can find good selection of Indian fish such as the Black Pomfret, White Pomfret, Kingfish, Mackerel. The entire store is extremely clean and well lit. The seafood section has fresh fish, shrimp, crabs and lobster as well. Besides buying seafood, its a great store to do your regular grocery. The Dallas area has one store in Carrollton. If you are unable to travel to Carrollton, then you may be able to find the fish in your local Indian grocery stores but you will only find frozen fish. We have typically been disappointed with the fish in the Indian grocery stores as we are not sure when it was packed. Indian Food is popular all over the world and Belgium is no exception. Belgium has its fair share of Indian restaurants mostly offering the standard Indian fare like Tandoori Chicken, Chicken Tikka Masala and Palak Paneer. You will find a variety in the price and decor, ranging from the Dhaba like Delhi Delicious in Antwerp to the seemingly fancy and upscale Au Palais Des Indes in Brussels . We have updated our Indian restaurants in Belgium section and added new restaurants with images, menus and other useful information. Here are some of the popular cities in Belgium. A man named Kundan Lal Gujral ran a restaurant called Moti Mahal in Peshawar before the partition of India. Trying out new recipes to keep his patrons interested, Gujral tried cooking chicken in tandoors (clay ovens) used by locals until then to cook naans (bread). The tandoors are bell-shaped ovens, set into the earth and fired with wood or charcoal reaching temperatures of about 900 degrees. Gujral was able to cook the tender chickens in these ovens making them succulent inside and crispy outside. After the partition in 1947, Punjab was partitioned with the Eastern portion joining India and the Western, Pakistan. Peshawar became part of Pakistan and Gujral found himself one among many refugees fleeing the rioting and upheaval by moving to India. He moved his restaurant to Delhi in a place called Daryaganj. The Tandoori chicken at Moti Mahal so impressed the first Prime Minister of India, Jawaharlal Nehru that he made it a regular at official banquets. Visiting dignitaries that enjoyed Tandoori Chicken included American Presidents Richard Nixon and John Kennedy, Soviet leaders Nikolai Bulganin and Nikita Khrushchev, the King of Nepal, and the Shah of Iran. 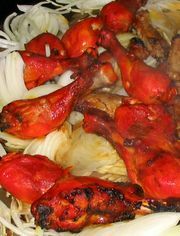 The fame of Tandoori Chicken led to many derivatives like Chicken Tikka Masala and Butter Chicken, commonly found in menus in Indian restaurants all over the world. We at, IndianFoodsGuide.com are proud to have hit the 16,000 listings mark in our restaurants section this week. Over the past few months, we have been working hard to improve the quality of information in our database and also trying to get more restaurants and reviews into our database. Thanks to some loyal visitors and our research team, we have been able to hit the 16,000 listings mark. We have found some interesting restaurants in all corners of the world such as in Reykjavik, Iceland, Marbella-Spain, La-Paz-Bolivia, Whangerai-New Zealand. We are very proud of this achievement in just over a year and are looking forward to hitting the 20,000 mark. 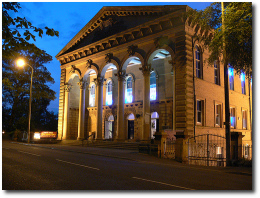 If you would like more information contact us .